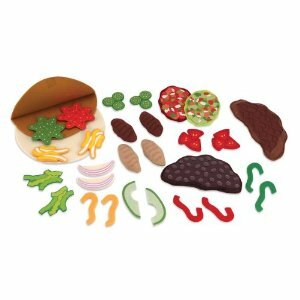 Stuff all your favorite fixin's into a 10-inch corn or flour tortilla for delicious pretend food play. 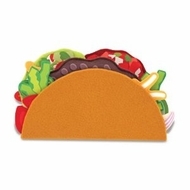 Your little chef can pile the delicious-looking felt pieces into the tortillas and then use the self-adhering strips to present "tasty" tacos. With strips on both sides, the "flour" tortilla can also be rolled into a burrito.